I told the landowner that I did, and he sighed and shrugged. The property that I was enquiring about hunting—a dilapidated barn surrounded by junk cars and farm implements overgrown with weeds on a parcel of land dominated by chest-high ragweed and goldenrod—understandably led to the landowner’s skepticism. After all, a deer hunter wouldn’t give the place a second glance, and the property—just 15 acres—seemed too small to hunt much of anything. If you were so inclined to scramble to the top of the falling barn you could have surveyed the entirety of the treeless, disheveled landscape at one glance. As a rabbit hunter, though, I’m drawn to what many people would consider waste space. That’s because, generally speaking, these unkempt properties make ideal rabbit habitat. The eastern cottontail—the most widespread and popular rabbit in North America—thrives in areas biologist refer to as early succession habitat. Before humans settled so much of the country areas recovering from fires, tornadoes, and other natural events that alter the progress of habitat maturation were ideal cottontail habitat. Once those areas reach the final stages of succession—usually mature forests with closed canopies and relatively little ground cover—they are less useful to rabbits. Cottontails thrive on chaos—at least in terms of habitat. Looking for a break from big game? Try chasing bunnies with beagles. Humans have helped this in many ways. Overgrown pastures, unmowed fields, and property that has been cleared for power lines all make great successive habitat for rabbits. And the best part is there are a lot of those areas to hunt. Cottontail rabbit hunting can be as simple as walking along fencerows with a .22 rifle. Since cottontails don’t change colors in winter like their cousins the hares they are more visible on snow. You can either look for rabbits in dense brush (their shiny black eyes are the feature most experienced hunters look for) or you can kick brush and jump-shoot them. My preferred method, however, is chasing bunnies with beagles. The earliest recorded instances of hunters pursuing rabbits with hounds in Europe dates back to the fourteenth century, and since that time the breed that we know as the beagle has become the ultimate rabbit hunting hound through selective breeding. Short of stature (so they can follow rabbits through thick brush), jovial and highly vocal, beagles can pursue rabbits singly or in packs. 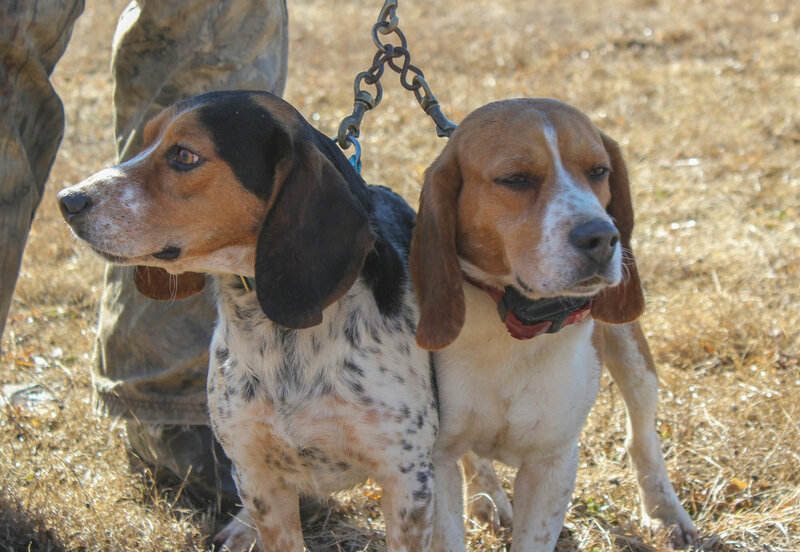 Many hunter prefer to hunt with two or more hounds since that doubles the odds of locating a rabbit track, improves chances of finding a lost trail and the chorus of multiple hounds crying on the scent of a bunny is music the beagler’s ears. Contrary to popular belief, beagles do not “circle” rabbits. Instead, they are slaves to the scent trail, following the rabbit wherever it leads. Because they have relatively small home ranges where they feel most comfortable, rabbits tend to run in circles and usually come back near the area where they were initially jumped. Successful hunters learn to listen to the dogs, determine when the rabbit has started to circle back and move slowly toward the sound of the dogs, watching and listening for the bunny. As with all hunting, safety is paramount when chasing rabbits with beagles. You want to choose a clear shooting lane and be certain of your target. If the rabbit is too close to the dogs or you aren’t sure the shot is safe you must pass. 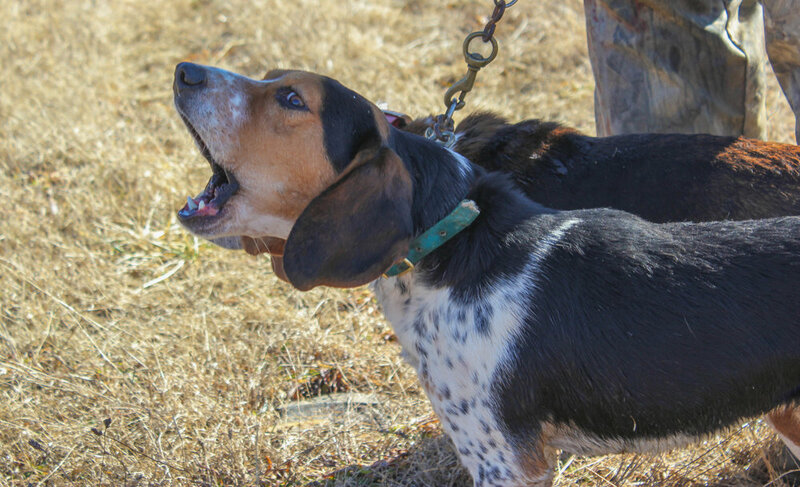 Groups like the American Rabbit Hound Association, American Kennel Club and United Kennel Club all host field trails where you can compete with your dogs in the off-season. These events are a great way to meet other beaglers and discuss bloodlines and training methods. When hunting rabbits with beagles a shotgun is the primary weapon of choice and most any shotgun will do. I’ve hunted rabbits successfully with single shot .410s (which are great for hunting in dense brush because they are light, handy and don’t damage as much meat as larger bores), 28-gauge, 20-gauge and 12-gauge guns, all with great results. 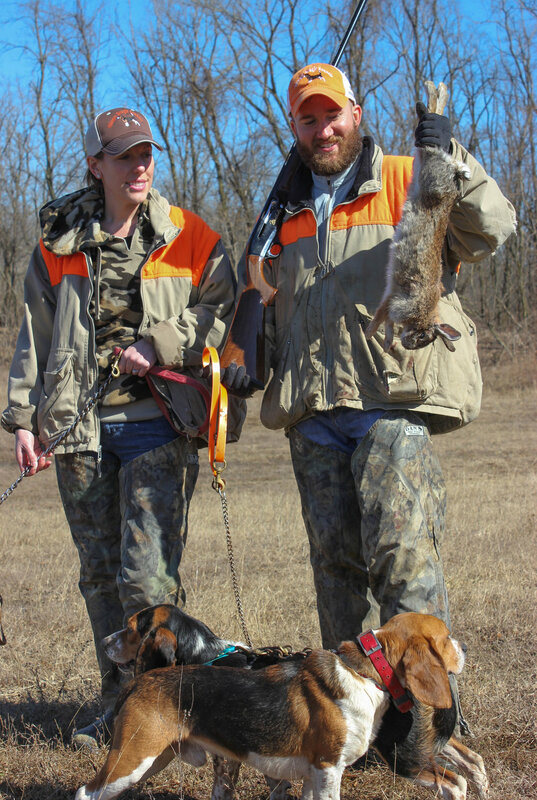 Most rabbit hunters wear briar-proof pants or bib overalls and it’s important to wear bright clothing like an orange vest and hat to give other hunters the opportunity to see you clearly in thick brush. Rabbit is also delicious table fare. Traditional cooking methods include frying or baking, but the classic German dish Hasenpfeffer is probably the ultimate way to serve rabbit.